When a new green wall is being designed, we are often asked: “How long will it take to grow and mature?” The answer depends on a range of factors, not least, which species of plant are being grown and the specific conditions of the particular site. Orientation – how much light and/or shade the plants will receive? Irrigation – how will the plants be watered? Will it be manually, by an automatic irrigation system or by rainfall? Soil conditions – are the plants growing in a rich and well drained growing medium, a poor sandy soil or a waterlogged clay soil? Maintenance – will the plants be well maintained with scheduled maintenance visits or left to fend for themselves? Plant condition – are the plants of good quality or are they unhealthy and lacking vigour? Species selection – have the plants been chosen with the site conditions in mind? Time of planting – will planting take place in (optimal) spring conditions or at another time of year? Once these factors have been considered, then the optimum plants for each site may be determined and a plant list drawn up for selection (we are happy to provide help and advice at each stage of this process, drawing on our team of green wall and horticultural specialists). Of course, once the plants have been chosen, their rate of growth will be far greater if they are regularly watered, fed and maintained (again, we provide full irrigation and maintenance services to customers, if required). With a wide range of stainless steel trellis Green Wall projects installed throughout the UK and Europe, we have seen at first hand the benefits of selecting plants carefully and the vital importance of irrigation and maintenance regimens. For example, at St Dominics College in Harrow, a carefully selected mixture of over 550 climbing plants including Clemetis Montana and Parthenocissus Tricuspidata were planted in 25 litre galvanised steel containers and trained to grow up the Jakob stainless steel Webnet structure. The plants were chosen specifically for the conditions of this site and were pre-grown off-site so they didn’t undergo too much transplanting stress when planted out. Planted in spring, impressive coverage had already been achieved by the first summer, providing excellent coverage of the stainless steel green wall trellis. 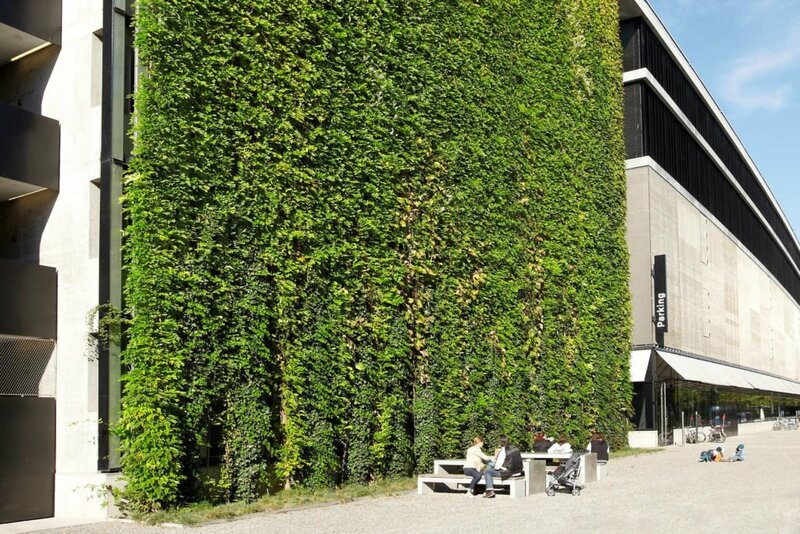 A great example of a successfully designed and planted green wall is the Sihl City Shopping Centre car park in Zurich, Switzerland . Jakob was responsible for the design, installation and supply of products for the 23 metre high x 25.5 metre wide stainless steel structure. 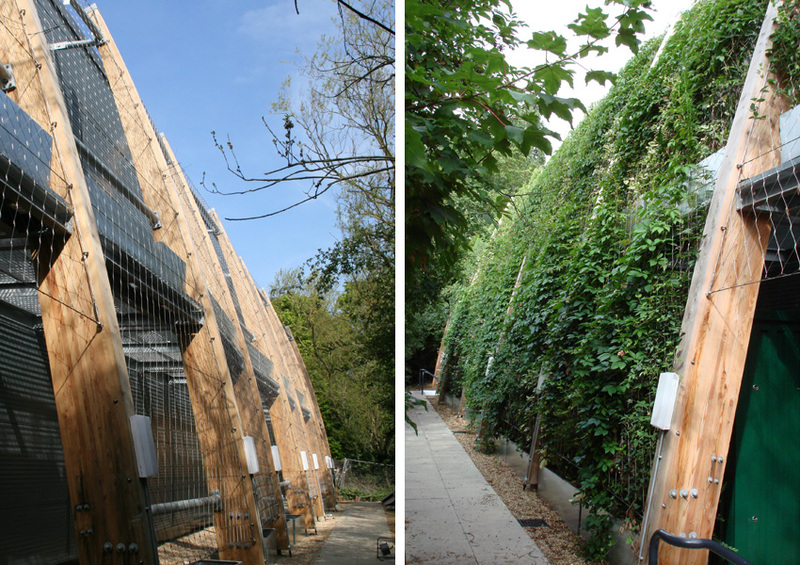 After around four years the eastern façade of the car park was hidden under a blanket of lush, verdant green growth provided by a combination of Wisteria Sinensis and Aristolochia sp. This phenomenal growth rate is due to the careful design and execution of the planting system, with Jakob working closely with the landscape architects to design a system which would provide optimal growing conditions for the chosen plants. This included suspending the stainless steel trellis system some 700 mm off the façade, to provide sufficient space for the plants to twine themselves around. In addition, the plants were grown directly in the ground (not into planters), providing a greater tolerance in watering and soil conditions, i.e. less chance of soil drying out or ‘slumping’ occurring. Regular maintenance ensures the plants remain lush and dense, not becoming ‘leggy’, sparse or overgrown. So, in answering the question: “How long will a green wall take to grow?” it is important to remember every green wall is unique, and so the answer will vary according to the factors we have discussed. However, as you can see from these case studies, plant growth can be surprisingly quick – and with proper design, planning and execution, each installation can deliver a beautiful, sustainable, bio-diverse and cost-efficient solution over the long-term. Some information provided by Tensile Design and Construct, agents for the Jakob system in Australia.